Buster slipped his head out of the partly open library doors when he heard the front door open. Maybe the Man had finally come home. The automations regularly refilled his food and water bowls and cleaned the litter box, but he missed the Man’s warm lap, his soft words, and the touch of his hands on the cat’s fur. It called his name but it wasn’t the Man. In fact it wasn’t a man at all. It was one of the Man’s machines but this one walked on legs like the Man. Before Buster could run, the man-machine moved faster than even he could and scooped him up. The cat loudly protested until the fingers of the man-machine found the spot on his tummy where he loved to be rubbed. I wrote this for the Flash Fiction for the Purposeful Practitioner for 2018: Week #11. The idea is to use the image at the top to inspire the authoring of a piece of flash fiction no more than 200 words long. My word count is 197. A cat? 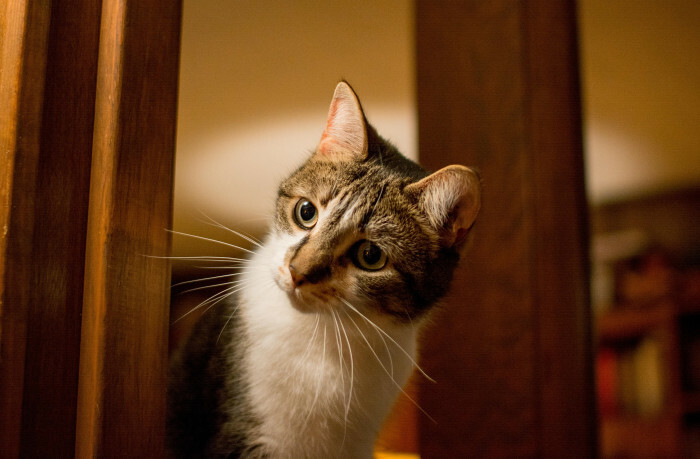 You want me to write a story about a cat? I don’t do cute cat videos. Okay, I’ll make this work. Unfortunately, the first thing that popped into my head was the 2004 film I, Robot starring Will Smith, Bridget Moynahan, and James Cromwell as Dr. Alfred Lanning. In one scene, Detective Del Spooner (Smith) goes to Lanning’s house looking for clues as to Lanning’s death and in the process, he finds Lanning’s cat. So I adapted the scene to this challenge using elements of the film and Isaac Asimov’s first “robots” detective novel The Caves of Steel. Technically, the events in that novel occurred well after Lanning’s death in the Asimov stories, but this is fiction after all. The human detective in “Steel” is Elijah Baley and his humanoid robot partner is R. Daneel Olivaw (The “R” in his name indicates he’s a robot). 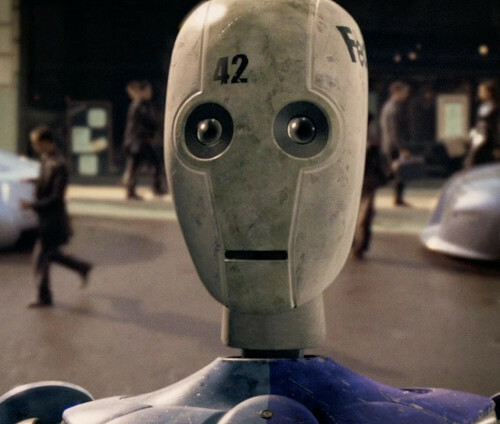 In my story, I imagined Olivaw to appear completely robotic, something like the NS4 models in the 2004 movie (see above). To read other stories based on the prompt or to post your own (please), go to InLinkz.com. Odd … my memory of those Asimov stories, and particularly of R.Daneel Olivaw, was that the robot appeared much more human-like, indeed, even handsomely so, which was part of the social resentment against him. Thus I must have read some description that impressed such an image into my memory. I certainly never imagined Asimov’s robots as they appeared in the film, but I didn’t let that hamper my enjoyment of the film and its version of the story. I know that but I changed the parameters of “Steel” for my wee tale. I didn’t want a humanoid robot but one that looked more like the machine, summoning the “partnership” between Spooner and Sonny in the 2014 movie. I imagined a fusion of the two, a human detective and a robot (and a cat) working together to solve Alfred Lanning’s murder. What a great job!!! Enjoyed. You are way ahead of me. I have not come up with an idea to write about. But when I was looking through the copyright free pictures, this one, I was drawn to look at closer. I couldn’t help wondering what he was thinking? Hope to see you again next week! I liked your take James, and remember the scene from I Robot. Yep. I watch it periodically just because it’s fun, although it doesn’t bear a huge resemblance to Asimov’s novels or short stories. Nice one James well done. Interesting story and I love mysteries but I wonder if the cat would really take to the robot. I like to think he still wouldn’t like the robot as a substitute. He probably wouldn’t, but the robot was fast enough to grab him before he could get away, and maybe living in Alfred Lanning’s house, he’s become used to them. Well, there’s no replacement for a human and I suspect Buster will take more to the human detective than the robotic one.